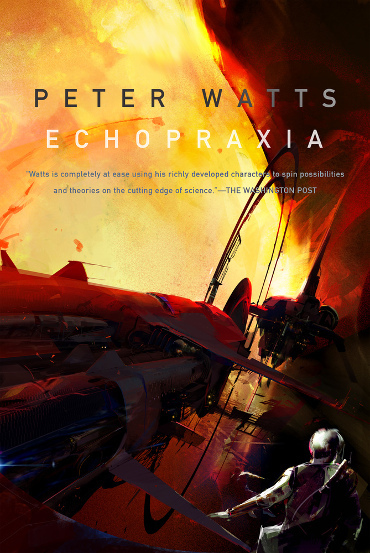 Page File There’s hard sci-fi and then there’s the likes of Peter Watts’ Echopraxia, a book that should come with its own scientific reference library to aid reading. Usually, being a fan of science-heavy writing and having a smattering of real-world knowledge is enough to unlock a hard sci-fi world – you just kind of lean back and let the science wash over you. You might only understand one in every five concepts, but you glean enough to work out what’s going on in general. Brüks winced and relayed the order, tossed a ‘bulb of coffee across the compartment (Coriolis turned it into a curveball but Moore caught it anyway with barely a glance), grabbed one for himself and twisted the heat tab en route. Coriolis was a subtle trickster. Having looked it up, you’ll find (if you didn’t already know) that the Coriolis effect has to do with apparent deflection of moving objects when they are viewed in a rotating reference frame, so the whole thing makes plenty of sense. However, the uninitiated would be forgiven for wondering just who or what this Coriolis was and when it would ever be explained by Watts – to which the answer, of course, is never. This kind of exclusionary writing has many fans of course, but it’s often tempered with fast-paced writing and easy-going plotting, both of which are in rather short supply in Echopraxia. Instead, you get long involved arguments about the nature of self in a bleak dystopic future-Earth where we didn’t bother with any solutions to pressing issues like climate change and population growth. Instead, boffins seem to have focused most of their energy on creating a neurological pick’n’mix of alterations for humans to inflict on themselves. Here we have vampires, but not as you know them; instead they’re the resurrected genealogical relation of humans, an extinct species that scientific tinkering has brought back from the dead. We also get zombies – usually of the military variety – humans who have excised various bits and pieces of their personality and morals, along with their willpower of course, to become the perfect killing machines for one nefarious purpose or another.